I’ve always been really interested in education, but especially so since my sister was born. Suddenly, understanding how child development worked and observing her learning patterns and what she responded to became so important to me, which then developed into wanting to learn more about education and helping children everywhere succeed regardless of circumstances. Children are our future. Considering that I’m only 20 and still have most of my lifetime ahead of me, I know that sounds really strange – technically, me and my peers are the world’s immediate future. But in the grand scheme of things, I recognize that I’m just one very, very, very small part of the world and of the future. While I’m here, I’d like to do my part in helping better the future. For my sister. For all the little kids who still don’t know how bigoted and rude and unfair the world can be, and hopefully will never have to know. For my future children, eventually, and for my friends’ future children. I don’t know how I will eventually help the world, but I’m good at design, I’m good at problem solving, and I enjoy working with people. I want to make the world more beautiful, both literally and figuratively. I like to think that so far, my time at MIT has reflected that – studying architecture taught me some of the most important design principles, and the projects I’ve invested my time in have been about things like educating people or making people happy. One of the nicest things about finishing my architecture studio requirements, though, is that I’ve been able to pursue other topics that I’m interested in. While I did take D-Lab: Schools as an architecture course (we were designing schools in Makuleke, Africa, which was really interesting – we had to figure out how to design a space that would accommodate for the kids, keep them cool in the hot summer heat, and wasn’t expensive to build), I wanted to take a class that was more about designing education instead of the space in which education is taught. Side note: I would love to design schools. That would be so fun. Granted, I would love to design all the things. There is still so much work to be done in making everything beautiful and comprehensive. This semester, I managed to get into a class called Digital Games for Education and Investigation. It’s a mashup of a game design class and an education class, and it’s split into 3 sections: the first, we had to take a game and write a curriculum around it (my group wrote ours around “Minecrafting English”); the second, we designed a table-top game; the third, to be determined. We haven’t started that section yet. Perfect Pitch is our table-top game. I am ridiculously proud of it. When we began designing the game, we were pretty hopelessly lost. We knew it was going to be about journalism and we knew it was going to be table-top and we knew it was going to incorporate some sort of role-playing aspect. We played around with the idea of editing the game Mafia to suit our needs, but we realized pretty quickly that just like there can only be a few “mafia” and a few “doctors” and a lot of townsfolk, Mafia wouldn’t allow the majority of the players to roleplay as journalists. To us, that defeated the purpose – we wanted everyone to gain something out of the game. After quite a few sessions of us not coming up with anything, I realized the only thing we had to do was switch the environment focus from an investigative scene (such as a crime scene) into the journalists’ office. In an office, everyone is a journalist or an editor – meaning that everyone would be roleplaying as one of the two! Once I proposed the environment switch, coming up with ideas became a lot easier. We decided we wanted the students playing to roleplay as different types of journalists, so that they could practice vying for a specific pitch. We wanted them to have to pitch to editors, so that they could practice their decision making skills. We knew pretty early on that we didn’t want anyone to be doing any legitimate writing – having to write more than a few sentences would make it a chore, not a game. Due to time limitations, our game wouldn’t allow for that kind of writing anyway – students would be practicing their quick thinking skills instead. although I opted for Baskerville (which I felt was more “journalistic”) over Helvetica. 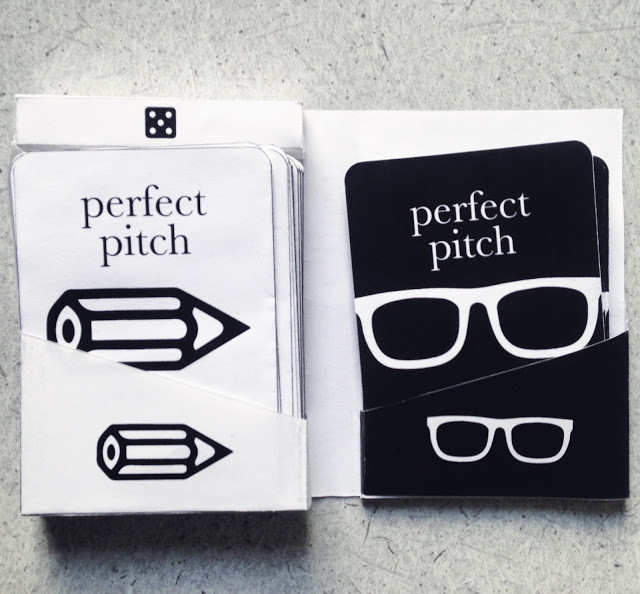 Perfect Pitch is a Cards Against Humanity / Apples to Apples style game, in that there are two roles and two types of cards. The two roles are journalists and editors, where one or two of the players would be editors and the rest would be journalists. The game accommodates for 3-10 players – if there are 5 or less players, there is only one editor; if there are more, there are two editors. The two types of cards are Topic cards and Publication cards. In our prototype, we made 38 Topic cards and 8 Publication cards. The Topic cards had real-life events detailed on them, written in a who/what/when/where format to remove subjectivity, in categories such as “International”, “United States”, “Politics”, “Arts”, “Travel”, “Science”, and more. The Publication cards had real-life publications with their point of view, audience type, and platform listed on them, but we changed all their names to avoid copyright issues (read: for our own entertainment). The way the game works: each person has 3 Topic cards in their hand. They each roll two dice and whoever(s) has the biggest number(s) get to play as editor for the first round. They reveal a Publication card, and the journalists then have two minutes to decide which Topic card in their hand is the most relevant for that publication and then develop a headline and a pitch. When their time is up, they each get 45 seconds to pitch their topic to the editor(s). The editor(s) then pick one or two of the topics that they feel suit the publication best, and then give a few short reasons for why they made those choices. The journalist(s) who won the round become the editor(s) for the next round (which is why, if there are two editors, they have to pick two topics to win). 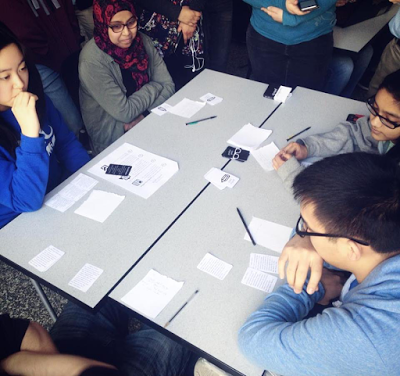 The game was designed with high school students interested in journalism in mind, so it actually complies with many high school English Common Core standards. To come up with pitches and headlines, students have to comprehend what their topics and publications are; to pitch the topic, students have to work on their presentation skills; to pick the winning front-page headlines, students have to practice their decision making skills. Even though it was designed with high schoolers in mind, the age range we defined for the game was 12-adult. When we had our peers play it in class, people got really competitive and increasingly creative with their headline titles, which was really exciting and interesting to watch – since our group saw the original headlines that our topics cards were based off of, it was more difficult for us to come up with different ones. Our peers, who had not seen the original headlines, came up with really fun titles! so they could write down the headlines they were coming up with. I’m super excited about our game! I think it came out really well and achieved a lot of the goals we had in mind. I enjoy that this class puts so much emphasis on making learning fun, because that’s exactly what learning should be. Have you ever designed a game? Do you think you would play Perfect Pitch with your friends?